Be sure to get only "Food Grade" quality because industrial grade can cut your lungs like asbestos. 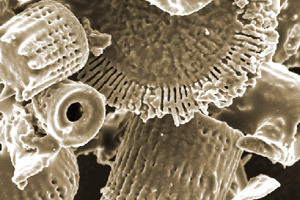 Food Grade Diatomaceous Earth is used around the house as an organic pesticide for the control of ants, cockroaches, silverfish, bedbugs, fleas, box elder bugs, scorpions, crickets, ticks, and many other unwelcome pests. Natural ant control is one of the biggest reasons for the usage of Food Grade Diatomaceous Earth in and around the home. For complete ant control, simply sprinkle the area of concern with fossil shell flour (DE). When the ants or other pests come in contact with the powder, it is like stepping on broken glass; they will be killed or abandon the area. Food Grade Diatomaceous Earth is an effective organic pesticide against fleas, ticks, lice, and other pests that bother our pets. Getting rid of ticks and fleas on your pets with fossil shell flour can be done several different ways. Take the diatomaceous earth and rub a handful into their coats. For natural tick and flea control, simply sprinkle it on their bedding, in the yard, or add it to the carpets. Use the hand held Pest Pistol Duster for easy pet dusting. Food Grade Diatomaceous Earth is also used internally to remove parasites and worms from your pets without the use of chemicals. Feed large dogs 1 teaspoon; cats and small dogs 0.5 teaspoon per day. It has been suggested that infected pets should be fed DE for 90 straight days, and then continue feeding every 3rd day. Use Perma-Guard Food Grade Diatomaceous Earth as a natural insecticide for the non-chemical control of aphids, whiteflies, beetles, loppers, mites, leafhoppers, and other insects. Sprinkle it inside your greenhouse, or outdoors on fruits, vegetable plants, flowers, grains, and grass—up to and including the day of harvest. Diatomaceous Earth controls insects by using physical, not chemical, action: It punctures an insect's exoskeleton and absorbs its body fluids—thus posing no harm to warm-blooded life. Moreover, on any surface, this natural pesticide has a remarkable repellency factor. As long as Diatomaceous Earth is present, insects tend to stay away, making a serious infestation unlikely. The more it is used, the more an environment is created which makes insects feel unwelcome. For young plants, as little as 2 lbs. per acre may be adequate. For larger plants, 5 lbs. per acre is probably sufficient. It applies best when there is dew or after a light rain. It is a long-lasting, natural, effective powder, impossible for insects to build up a resistance against.